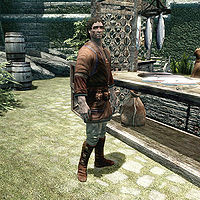 Addvar is a Nord fishmonger selling his wares from the market in Solitude. He is the husband of Greta and father of Svari. His wife will take over running their marketplace stall if he dies. While his wife lost all hope following the execution of her brother Roggvir, Addvar seems focused on providing his family a proper income during tough times. He gets out of bed at 6am and heads to the market, where he sells his produce for a whopping fourteen hours in a row. At 8pm he returns to his house and spends the evening enjoying the cooking of his wife and the company of his daughter. At midnight, he heads upstairs and goes to bed. While he will promote his services around the clock, you can only trade with him from his stall. Like the rest of his family, Addvar is quite poor and his attire reflects that. He wears a set of cheap merchant's clothes along with a pair of boots. Due to a bug he doesn't carry his house key, but a key to one of the prison cells in the Karthspire. He wields an iron dagger and carries a selection of lower-class items and gold. At all times, Addvar will promote his fish business around the clock, saying, "Plenty of fresh fish for ya. ", "I've got some salmon to sell. ", "You shouldn't leave Solitude without trying our fish. Best in Skyrim." or shouting, "Fresh fish! Fresh fish! ", "Fresh Fish! Straight from the Fjords!" and "The finest fish, here! Caught daily!" He will also explain that he finds his wares at the docks. "There are a few good spots, if you can avoid the East Empire Company workers and those Red Wave thugs." When confronted with the fact that he and Svari were at the execution of Roggvir, he will explain, "Svari, yes. It's been hard on her. The girl misses her uncle. 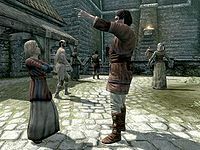 I've tried to explain that Roggvir did something bad and that we all have to be accountable for our actions but... a child feels what she will." Upon exiting conversation he will say "These are troubled times. Be on your guard out there." or "May the gods speed your journeys... and steady your sword arm." Greta: "Maybe we'll have better luck tomorrow." Addvar was accidentally given a key to one of the cages in Karthspire instead of his regular house key. Considerable dialogue was written for Addvar and his various customers. Unfortunately, they were recorded in Jala's voice. Some are improbable for Jala, and conditions are set to prevent them. The rest are rarely heard, as they are mixed with Jala's other dialogue. Addvar: "A little late in the day for your rounds Sorex." Sorex: "I seem to have more chores for the Winking Skeever each day. I still have a delivery to do too." Silana: "Fresh fish sounds like just the thing today, Addvar." Addvar: "I've been pushing the Salmon but I'll tell you the Slaughterfish is a bit better today." Silana: "Thank you, Addvar, I am picky about what I eat these days." Aia: "Salmon sounds good today." Addvar: "Speaking of sounding good, I've heard a couple of your classmates on the street recently." Aia: "As long as they're playing instruments they're passable. You don't want to hear them sing." Rorlund: "I wish we could have absolved your brother-in-law of his sins before his execution." Addvar: "I don't think he would have wanted your absolution, Rorlund. He worshiped Talos. I appreciate the thought though." Addvar: "Jawanan, I don't see you here often." Jawanan: "I do not like fish." Addvar: "Okay. Well. That's all I've got." Jawanan: "I am buying a fish for Noster. He likes fish." Addvar: "A sale's a sale but I have to know... why are you buying something for Noster?" Jawanan: "A war veteran should be respected." Illdi: "I'm sorry about Roggvir. It's a shame, I liked him." Addvar: "Greta is taking it hardest. She won't go to the Temple of Divines anymore." Ataf: "I went out ice fishing a few days ago." Addvar: "Brave man, with the Blackbloods out there. Did you catch anything?" Ataf: "Naw, mostly just froze." Addvar: "Well, keep at it. The fish have to get to know you before they're willing to bite." This page was last modified on 18 October 2018, at 02:37.